This one is kind of a downer, but it’s a question that, sadly, gets asked quite a bit. Should I bring a gift to a funeral or memorial service? What is the gift-giving etiquette for when you see or visit a family after a loved one has passed away? Here is all the memorial gift etiquette explained for funerals and memorial services. The Question: Should I Bring A Gift To A Funeral? The first part question has to do with should, as in, Do I have to? The correct answer is, no. You don’t have to bring a gift for the family when you go to a funeral. Of course, for most important occasions, it’s always a good idea not to arrive empty-handed, and especially so if you’re close to the family. That’s why funeral flowers are so popular as funeral gifts; a fresh bouquet of flowers is a simple, beautiful, and heartwarming gesture that honors the decedent and shows others that you care. But not everyone likes flowers. Some pundits even suggest that you shouldn’t give flowers because they will inevitably remind the recipient of death as they decay. Not the greatest option for the sensitive types, eh? Still, flowers are traditional, so most people will appreciate flowers brought to the funeral. It can be a full funeral bouquet or a single rose. It can be expensive or just a few dollars. The point in this is to bring something that shows respect for the person who passed away and to demonstrate to the family that you care enough to go out and get a small token of your love. There are also a variety of memorial gift alternatives that many families appreciate. We’ll get into that in a bit, but first, let’s summarize where we’re at so far. Question: Should I bring a gift to the funeral? Answer: You don’t have to bring a gift, and in most cases it’s not expected or required. But a small, thoughtful gift is a nice gesture and probably a good idea if you’re especially close to the family. 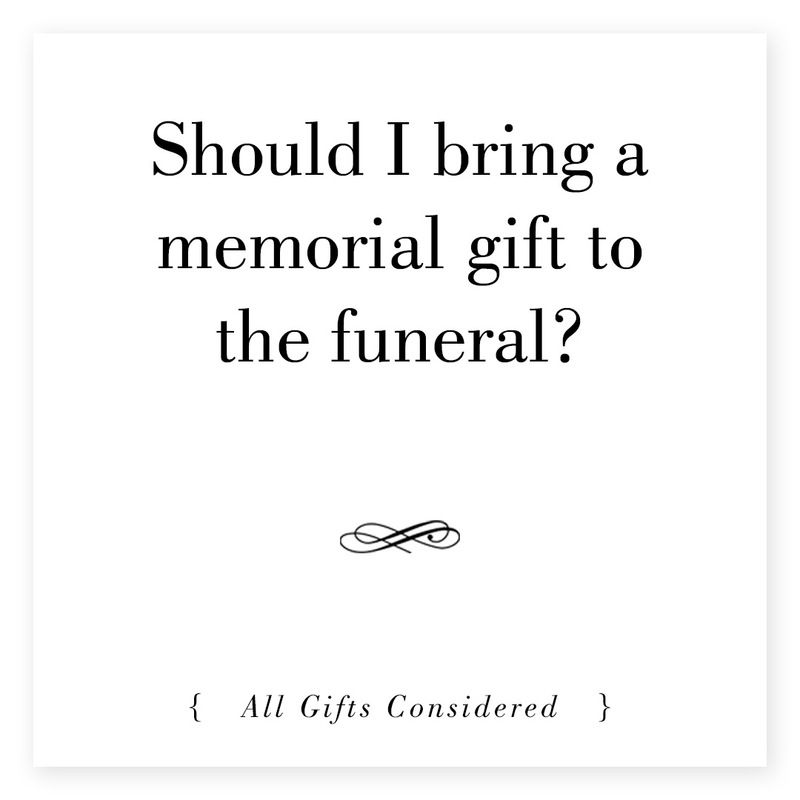 The Other Question: Should I Bring A Gift To A Funeral? The other part of the question involves the occasion for the gift. A funeral is a communal event, and all that is really required at the funeral itself is your respecful attendance. Small gifts like flowers, cards, or small food items are perfect. You can give these types of items to the family and it will be a pleasant gesture that isn’t a distraction. If you would like to give something bigger, more involved, or more meaningful, it would probably be best to give it at another occasion. Save the gift until you can stop by for a visit or drop it off at the house. The week or two after the death of a loved one is a blur for most family members, during which they see many people, make many decisions, and get all sorts of small gifts. Wait for two weeks after the death, or about a week after the funeral, and then contact the family to ask if you can drop off the gift or if they would prefer a visit. Tip: Always ask if you can stay and visit, and give them the option to just have you drop it off at the door or on the doorstep. Some grieving people have days when they need to be alone; others feel alone and appreciate the company. Be ok with either. 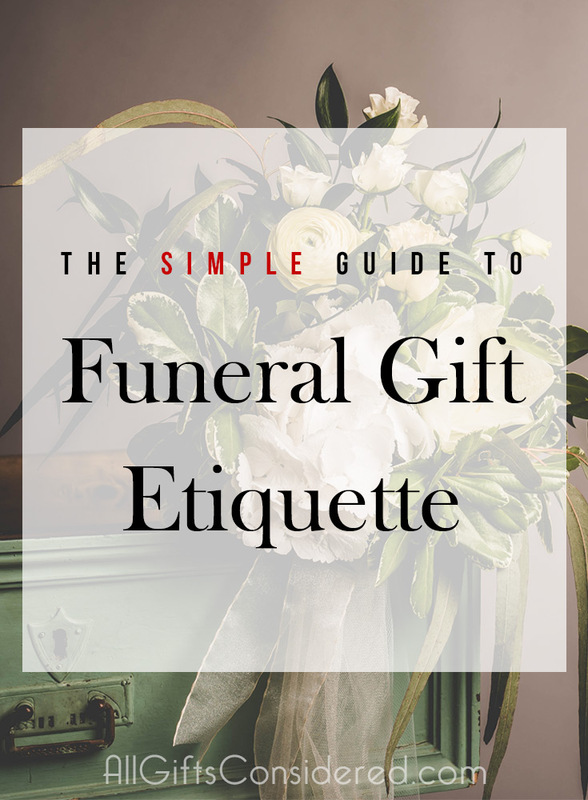 At the end of this article we address a few common questions about memorial gift etiquette and funerals. But first, here are a few ideas for what to bring to a funeral, and what to send when you can’t attend. Inexpensive yet heartfelt and touching. A elegant token that shows you’ve taken the time to select something beautiful in honor of the departed, yet simple enough that you can leave for the funeral twenty minutes early and easily pick one up at a flower shop. The classic gift to bring to a memorial service. These are the traditional “funeral flowers,” and in some circles can be an expected gift from family and friends. Lots of meaning can be conveyed in your flower choice – see here for more info on the symbolism of various funeral flowers. Take the time to write out a brief note expressing your condolences. Here are some tips on what to write; and here are some creative and/or handmade sympathy cards. A gift certificate for a favorite restaurant or store can go a long way. Give an Olive Garden or Applebee’s card if the whole family is visiting and tends to eat out; for a family with tough finances ahead try a WalMart or Amazon card or something from the local grocery store; or maybe go with Starbucks or Subway for the busy mom or working dad. Food is a true funeral tradition. Bring your special dish to the reception, along with some disposable containers so that the family can take the leftovers home. Also consider the family’s needs before or after the service. Few people feel up to cooking after a loved one dies. So consider bringing a hot meal, or one for the freezer. Better yet, make sure the family is receiving plenty of food now and then arrange to bring a meal three or four weeks down the road for after the immediate attention dries up. Here’s a helpful Guide to Sympathy Meals After A Funeral. Memorial gift etiquette is evolving; no longer are you restricted to sending flowers and food gift baskets. 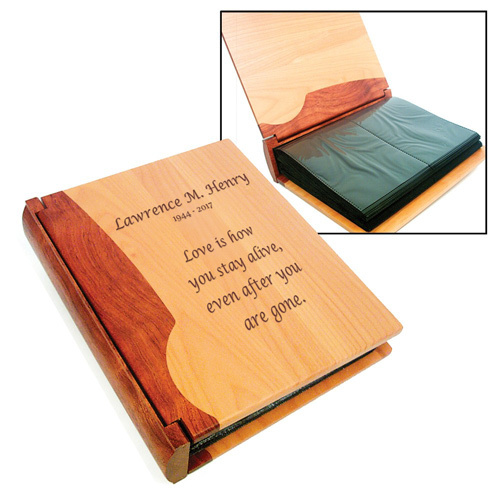 Here are a few creative options for sympathy and memorial gifts for when you can’t attend the funeral. Many people are choosing unique alternatives to sending the traditional funeral flowers. 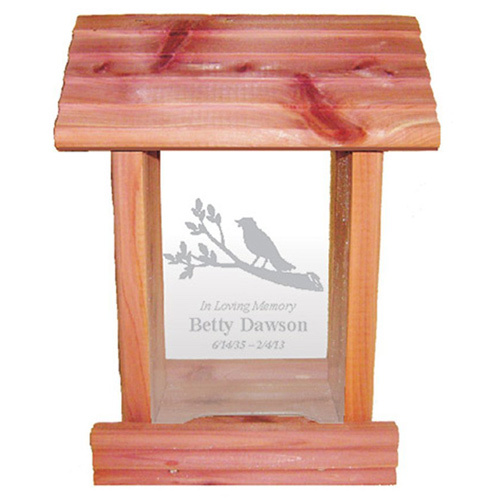 One proven choice is this Personalized Cedar Wood Bird Feeder, which can feature one of many themes such as the Bird on a Branch (above), plus Butterfly, Celtic Cross, Elk Hunting, Soaring Eagle, and more. Additionally, you get the person’s name and dates etched onto the clear front panel with an “In Loving Memory” inscription. Also available with military service emblems or with completely customizable text on both sides. Still loved, still missed, and always dear. There are also customizable garden stones that include name and dates; here is a popular and elegant one. 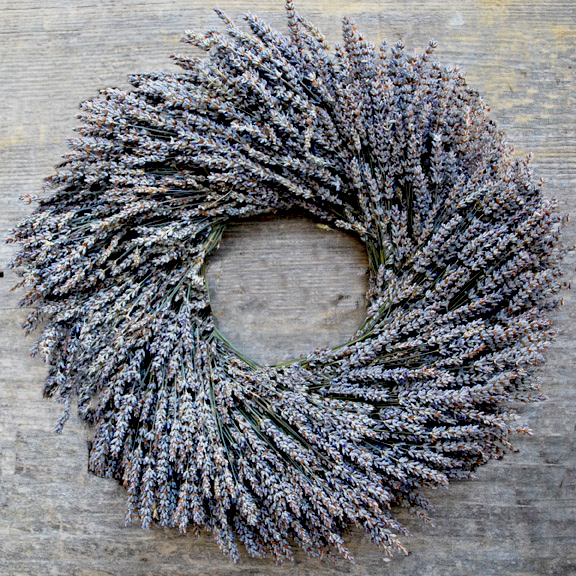 This gorgeous organic Oregon-grown Lavender Sympathy Wreath conveys the meaning of serenity, grace, and calmness. Other popular organic wreaths include the “living” Echeveria Succulent Wreath and the rustic Larkspur Loop Wreath. Browse more Oregon grown and harvested organic sympathy wreaths here. Available with just about any personalization you can dream up here. 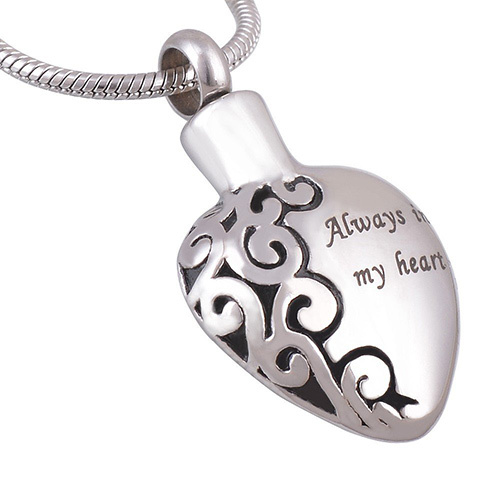 The “Always in my heart” cremation memorial necklace is a lovely little gift for anyone who has expressed an interest in keeping a small amount of cremated remains close to their heart. There are many other types of elegant cremation jewelry pieces, from attractive & affordable stainless steel designs to premium sterling silver and gold memorials. These last include rings, bracelets, and necklaces in a wide selection of styles with custom engraving available, including fingerprint jewelry. Nowadays, cremation and traditional full-body burial are chosen at about the same rate. If the departed is being buried in the traditional manner, memorial jewelry can still be used to hold a lock of hair or perhaps a bit of earth from the burial site. There are other options for jewelry as memorial gifts; see here for some beautiful and meaningful jewelry sympathy gift ideas. Your gift doesn’t need to break the bank, but it should also convey the amount of love and respect that you would like it to show. Most funeral flower bouquets can be had for $20-100, so that’s a good price range. Calculate in your own personal life situation and budget, as well as the family’s sensibilities, and you should be able to come up with a good price range for your gift. This is one of those occasions where it really is true that it’s the thought that counts. So a single rose, a small floral bouquet, a box of nice chocolates, or a decent bottle of wine can all be entirely appropriate gifts, and all can be found for less than $20. CAN I STILL BRING/SEND A GIFT IF THE FAMILY ASKS FOR A DONATION IN LIEU OF FLOWERS? Yes, but you should probably do a donation as well, and mention it to the family. Not as a humblebrag, but to let them know that you have honored their request and that you would still like to give them something on top of the donation. SHOULD I BRING A GIFT EVEN IF THERE ISN’T A FUNERAL? Yes, by all means. 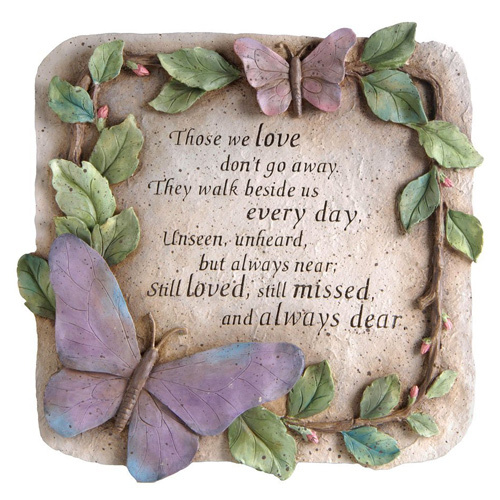 Sending a memorial gift sends a message to the family that you are thinking about them and care enough to get a gift. The death of a loved one is very difficult, and there are many reasons why a family might not have a funeral – whether by choice or necessity. A sympathy gift is a great way to provide some communal support and comfort when the family isn’t (for whatever reason) able to get that from a service. I DIDN’T GET THE GIFT IN TIME FOR THE FUNERAL. SHOULD I STILL SEND IT? Of course! As mentioned above, the week or two after the death of a loved one are busy times. It’s afterwards that the grief truly sets in. Your gift might be even more appreciated if it arrives after the funeral. Everyone is different, and has different opinions about this, but most often the recipient will simply be thankful that your are thinking of them. SHOULD I EXPECT A RESPONSE FROM THE RECIPIENT? No. Of course most people will respond at some point – it may be a thank-you note sent promptly after the funeral, or it might be a phone call or text two months down the road. Be patient, and don’t be offended or pushy about it. They’ll either get around to it, forgot, or thought they already responded. Whatever the case may be, remember that it’s a tough time for the recipient, and that the gift is about them and not you.